Theresa May and her cabinet are looking for ways to bring her EU withdrawal agreement back to the Commons for a fourth attempt at winning MPs' backing. The PM said the UK would need "an alternative way forward" after her plan was defeated by 58 votes on Friday. MPs from all parties will test support for other options during a second round of "indicative votes" on Monday. However, Conservative Party chairman Brandon Lewis said the government did not support any of those options. Labour leader Jeremy Corbyn refused to say whether his party would offer an option to remain in the EU during these votes, but said the obvious choice was "a good economic relationship with Europe". The latest vote came on the day the UK was supposed to leave the European Union: 29 March. The date was postponed to allow Mrs May more time to find a Brexit solution. Friday's defeat was the third time MPs have rejected her withdrawal agreement - the first vote was lost by 230 votes, the second by 149. The government has so far failed to win over 34 Conservative rebels, including both Remainers as well as Tory Brexiteers, who say the deal still leaves the UK too closely aligned to Europe. Northern Ireland's DUP - which has propped up Mrs May's minority government - also continues to oppose the deal. But a No 10 source indicated the prime minister would continue to seek support in the Commons and insisted efforts were "going in the right direction". MPs will hold another set of non-binding votes on various Brexit options in the Commons on Monday. None of MPs' eight proposed Brexit options secured a majority in the last round of "indicative votes" on 27 March, but the options which received the most votes were a customs union with the EU or a referendum on any deal. Brandon Lewis told Radio 4's Today programme: "The government's position is very clear - we do not support these options. The government's position is we believe the best way to respect the referendum is to deliver the deal." He said staying in a customs union with the EU would go against the result of the referendum and the Conservatives' election manifesto. However, Mr Corbyn said Labour would propose a deal that did involve a customs union with the EU - to protect the issue of avoiding a hard border in Northern Ireland. He said: "I'm convinced at that after spending a lot of time meeting with and talking to officials in Europe." Nicky Morgan, a former cabinet minister and Tory MP, said one way to end the Brexit deadlock could be a government of national unity - which is a cabinet made up of different parties. She told Today: "There have been periods in our history when we have had national unity governments or a coalition for a very specific issue." There is every chance that the prime minister will again - with routes outside the normal boundaries - try to make a version of her Brexit deal the end result of all of this. Despite a third defeat, despite the embarrassment of repeated losses, don't imagine that she is ready to say a permanent farewell to the compromise deal she brokered with the EU or, straightaway, to her time in office. There is still a belief in the heart of government that there could be a way round, perhaps to include the prime minister's agreed treaty as one of the options that is subject to a series of votes that will be put in front of the Commons next week. 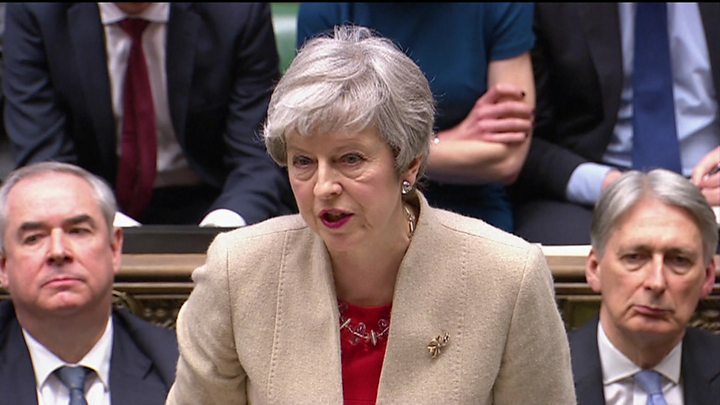 Earlier this month, EU leaders gave the PM until 12 April to come up with a Brexit solution; if her deal had made it through Parliament on Friday that date would have been pushed back to 22 May to allow time to pass the necessary legislation. Since the deal was rejected, Mrs May now has until 12 April to seek a longer extension to avoid the UK leaving without a deal. Commons leader Andrea Leadsom said she remained "confident" the government could deliver Brexit, adding that "we have to keep trying". Tory Brexiteer Andrew Bridgen said leaving the EU without a deal was the best option on the table. "No deal is the only way we're going to get out, fulfilling our manifesto pledges and the commitment we made to the British people after the referendum," he said. 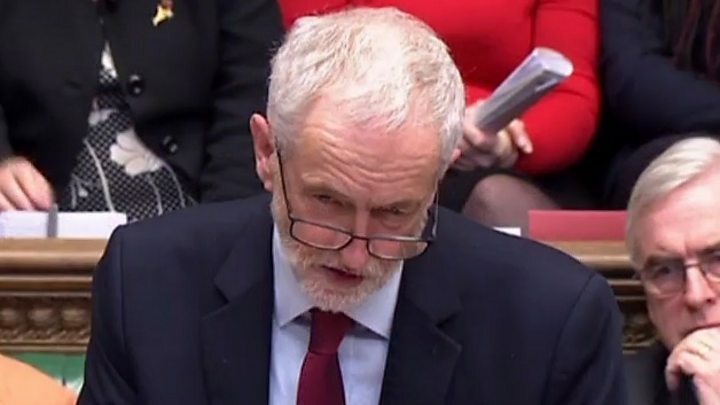 Media captionJeremy Corbyn: "This deal now has to change"
Mrs May said it was "almost certain" there would have to be an extended delay to Brexit to allow the UK to take part in the European elections at the end of May if her deal does not go through. But Downing Street later said this was not an "inevitability". If Mrs May wants to hold another vote on the deal in Parliament, it has to comply with Commons Speaker John Bercow's ruling that it can only be brought back with "substantial" changes. Wednesday, 3 April: Potentially another round of so-called "indicative votes"
Meanwhile, Leave voters registered their anger at the latest vote rejection with a protest at Westminster. Thousands gathered outside Parliament to protest against the delay, bringing traffic to a standstill. Meanwhile Conservative former Attorney General Dominic Grieve, who has campaigned for a further referendum on the deal, is facing deselection after losing a vote of no-confidence in his Beaconsfield constituency. The prominent Remainer, who remains an MP for the time being, clashed with his local Conservative Party over Brexit. Will European leaders accept a longer delay to Brexit? Despite all the drama, the money and time spent by EU leaders on Brexit (summits, dedicated governmental departments, no-deal planning) and all the hard, hard graft put in by the EU and UK negotiating teams, Europe's leaders are asking themselves what there is to show for it all. Ongoing Brexit divisions in Parliament, in government and in Theresa May's cabinet were on screaming technicolour display again last week. EU leaders used to use the threat of a no-deal Brexit as a negotiating tactic (as did the UK). They now believe it to be a very real prospect. That has led to a number of countries - notably France - questioning the logic of delaying Brexit for much longer. They wonder if the UK will ever unite around a Brexit Way Forward - be it a softer Brexit, no deal or no Brexit. Would a Brexit extension, allowing for a general election or a second referendum, really settle the issue, they ask? Brexit: What happens next after latest government defeat? Brexit votes: What happens next?